For more information about this Proven Safety Countermeasure, visit the Office of Safety's U-Turn-based Intersections web page. 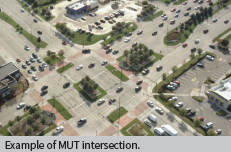 1 Edara et al., "Evaluation of J-turn Intersection Design Performance in Missouri," December 2013. 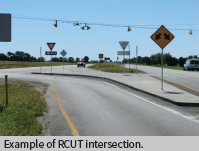 2 FHWA, Median U-Turn Intersection Informational Guide, FHWA-SA-14-069 (Washington, DC: 2014), pp. 41-42. Reduced left-turn conflict intersections are geometric designs that alter how left-turn movements occur in order to simplify decisions and minimize the potential for related crashes. Two highly effective designs that rely on U-turns to complete certain left-turn movements are known as the restricted crossing U-turn (RCUT) and the median U-turn (MUT). The RCUT intersection modifies the direct left-turn and through movements from cross-street approaches. Minor road traffic makes a right turn followed by a U-turn at a designated location â€“ either signalized or unsignalized â€“ to continue in the desired direction. The RCUT is suitable for a variety of circumstances, including along rural, high-speed, four-lane, divided highways or signalized routes. It also can be used as an alternative to signalization or constructing an interchange. RCUTs work well when consistently used along a corridor, but also can be used effectively at individual intersections. The MUT intersection modifies direct left turns from the major approaches. Vehicles proceed through the main intersection, make a U-turn a short distance downstream, followed by a right turn at the main intersection. The U-turns can also be used for modifying the cross-street left turns. The MUT is an excellent choice for heavily traveled intersections with moderate left-turn volumes. When implemented at multiple intersections along a corridor, the efficient two-phase signal operation of the MUT can reduce delay, improve travel times, and create more crossing opportunities for pedestrians and bicyclists.